You are here: Home > Have you seen a cassowary? Tell us please. Have you seen a cassowary? Tell us please. The Southern cassowary (Casuarius casuarius johnsonii) is in crisis. Current estimates suggest less than 1200 birds exist in the wild. A number of factors are contributing to the birds demise, but habitat loss is probably the greatest. Saving the c assowary is not just a matter of preserving a large, unique and colourful bird, or because the tourist income it generates makes economic sense. It is important because it is the gardener of the rainforest. By eating seeds it spreads them far and wide, especially the largest ones which smaller birds and bats cannot manage. This ensures the genetic diversity necessary for reproduction of the forest. 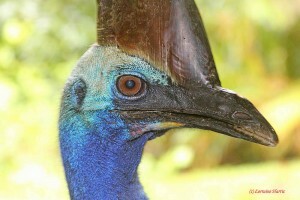 This vital role cannot be overestimated as it not only sustains the cassowary itself, it also ensures the survival of all of the fauna of this unique ecosystem. Kuranda Conservation has a database of cassowaries in the Kuranda region and you can help by telling us when you see them and where. It will also help if you can tell us about scats/droppings/stools (we usually just call it poo), as this is more frequently observed than the birds. Any information about a sighting is good, but the list below is a guide to the most useful information. The information is recorded in our database. Any other information you think might be useful, e.g. do you see the birds often, were they doing something interesting. Feel free to bring a sample of the poo into Kuranda Conservation if you are not sure if it is the right stuff.